I'm looking for a solid but relatively inexpensive antenna switch for UHF / VHF. I need to connect to two antenna which have SO-239 inputs, and my radio on the other end has got an SMA female connection. Anyone know of any good switch like that (two SO-239 inputs and one SO-239 output)? OP what is the purpose of Two antennas? Excuse my ignorance, but isn't loss a big concern with VHF and standard antenna switches? I've got a GMRS antenna and 2-meter VHF antenna as well. I don't understand ... do these things just select the best antenna for txing and shift all the power over there? 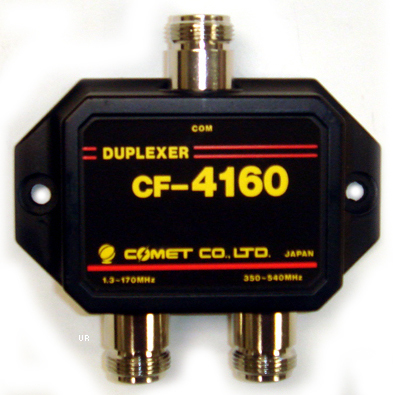 Comet calls these "duplexers", but they are also referred to as combiners or splitters. They are basically band-pass filters, simultaneously passing RF in both directions through the common connector while the band-pass filters provide a high degree of isolation between ports. technically it's a diplexer, and it is a selective bandpass switch. the radio attaches to the common port. RF emissions which are in the VHF band (say, <300MHz) are passed to one port (A) and blocked at the other (B), and RF emissions which are in the UHF band (say, >300MHz) are directed in the inverse manner (passed at B, blocked at A). take the CF-4160N as an example. the radio connects to COM. the LPF is 1.3MHz to 170MHz. so 2m (~146MHz) will come out he LPF port, but GMRS (~450MHz) will not. attach 2m antenna here. the HPF is 350MHz to 540MHz. so GMRS will come out of the HPF port, but 2m will not. attach GMRS antenna here. all else being equal, get the diplexer with the lowest insertion loss (e.g. <0.25dB) and the highest isolation (e.g. >50dB). it is unlawful to transmit on GMRS frequencies using equipment designed, marketed, and FCC-approved for amateur radio frequencies. Thanks for the detailed response! Also, just to clarify, the radio that prompted this is actually an approved GMRS / Marine VHF radio from Cobra (and I actually have a GMRS license!). One tuned to GMRS frequencies and another one for VHF. is it too late to back up and try another route? I was gonna suggest seeing if you could fine tune a ham dual band antenna to see if you couldn't get it to work for Marine/GMRS. I know what you mean though. I have a 5/8 wave VHF antenna on my dd as well as a UHF 5/8 wave up on my roof. Two separate radios, and the dual band didn't have the bandwidth for jumping back and forth between ham and business so I added another antenna to the roof. Also, just to clarify, the radio that prompted this is actually an approved GMRS / Marine VHF radio from Cobra (and I actually have a GMRS license!). the diplexer i posted above, and several others from that link, will work in your situation. Perhaps not. You're talking about one of these, right? How would you expect it to perform vs two dedicated antennas? Just as good? 90%? 75%? P.S. Sorry for all the dumb questions, I'm a frickin' noob. FWIW: I have one, I LOVE it. it works like a champ for my purposes. I'm a noob too, but have to believe it's broad enough to work with what you are intending within reason. I've used it with base and HT's and it performs! Yeah, I apparently can't quote right either. A) "Dual Band 155/460 MHz - Search & Rescue" <-- is 460 close enough to GMRS and 155 close enough to Marine VHF? B) "Dual Band GMRS & MURS - 152/462 MHz" <-- is 152 close enough to Marine VHF? Technically that's three or four questions, but I guess I'm really trying to figure out this: how close does my antenna have to be tuned to the frequencies I want to work with for it to be "good"? How for off of the listed frequencies will these antenna suffer a SWR > 1.5:1? for a VHF antenna of about unity gain (meaning -3dbi to about +6dbi), the typical 2:1 bandwidth is about 5 MHz. the more gain and the more elements, the narrower the 2:1 bandwidth will be. I'd see if he can make one tuned to Marine VHF and GMRS for you. The Ed Fong PVC Jpole can prolly be purchased tuned to your specs. He mentions that in his description. I have one of these at the barn (shack) and Dig it as much as my Arrow.